ARAUNY offered information to the 3,000 people who attended RCSD’s Family Day in the Park at Ontario Beach on lovely Saturday, June 4th, 2016. The vast majority of people passing our table were very interested in talking to us or picking up some materials, with the most common they chose being the “Truth About…” series about farmed animals. People want to know. Our stuffed kitty cat was extremely popular, with almost every person who passed giving her a pat or a hug. A few children took her for a brief walk with them, but were convinced to return her. 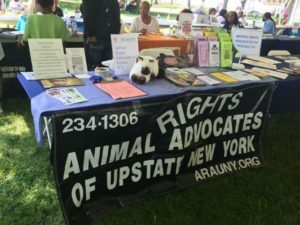 The Rochester Area Vegan Society was there, too, and we urged everyone, particularly the many people troubled by the use of animals for food, to visit their table to see how easy it is to choose peace for animals. We’re grateful to RCSD for allowing us to come, and inviting us to return for an event in late August. Thank you to Martha, Carol H., and Mary for also staffing the table.